We can convert your Adobe Photoshop files to clean and optimised HTML from just £150. The process of converting PSD’s to HTML can be a burden for any developer or designer during a project. It stops them doing what they’re good at and means their focus is elsewhere. It’s easy to reduce this burden by handing the task to someone else at a reduced cost, whilst getting back the same result. Our conversions are pixel-perfect and are built with both the developer and end-user in mind. They are constructed in such a way that they are are both easy to understand for future coders, and optimised for speed and compatibility. 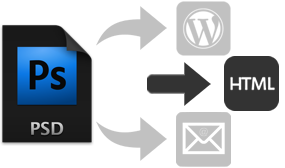 At BIOSTALL we don’t use any automated software to convert the PSD and produce the finalised HTML. We only produce the best, hand-coded and clean code ensuring the maximum integrity is retained between the design and code.